When I think of a dish to make for special guests or to mark an occasion, I never think of making lasagne. I love its homey comfort and how when it’s cold outside it soothes and warms. It’s not a short cut dish to whip up when you get home from work and pressed for time; you need a couple of hours to put it together and give it time to bake. There are short cuts to take, like no-boil noodles or fresh pasta you pick up at the grocery. But please, never ‘Italian-mix’ grated cheese out of a resealable bag. You can make it ahead of time, bring it to potlucks and if you need to feed a bunch of people for not much money, it’s a good bet. You can describe any casserole the same way, too. And that’s what I thought of lasagne – a glorified casserole. Have you seen the Italian film “Pranzo di Ferragusto?” In English, it translates as “Mid-August Lunch.” A scene from the film triggered a re-think of what lasagne could be. The film is about an unemployed and past middle-aged bachelor, Gianni, who lives with his glamorously decrepit, elderly mother in Rome. To pay off her debts, he takes in other elderly mammas over the Ferragusto holiday, pawned to him from the condo superintendent and family doctor in exchange for much needed Euros. So, the table is set for Gianni, a soulful cook, to feed his mamma and their new lodgers. One of the meals he makes for them is lasagne. Gianni took his time, drank wine while preparing it, negotiating with one of the mammas on adding the cheese. These mammas, all giving off the airs of accomplished cooks themselves, are seriously pleased with the lasagne. How could that be? When you’re cooking to impress, can you impress with a casserole? Fast forward a bit: I’m celebrating my birthday this past summer at an Italian restaurant in Toronto (Campagnolo – so good!). For my celebratory birthday dinner, I ordered their lasagne. There was a steak and something else I can’t remember that was expensive and celebratory on the menu but I had that scene from “Pranzo di Ferragusto” in the back of my head when I ordered the lasagne. And it was a beautiful, swoon-worthy special dish. A celebratory dish. What was it about it? It was the amazing toothy texture of the homemade pasta; the savoury, meaty ragu; the melted, slightly blistered cheese; the creamy nutmeg flecked béchamel. Yes, the way I’m describing all of these components are mouthwatering but when you put them all together, it’s out of this league mouthwatering. I had to try this myself. I decided to make a totally from scratch Lasagne alla Bolognese al Forno. Oh lordy. This was a lot of work. We’re talking 7 plus hours just to get the damn thing into the oven. By that time, my arches were hurting and my feet were totally swollen from standing for so long. There was a sharp throbbing pain underneath my right shoulder blade. I was tired. And the kitchen looked like a disaster. I looked nothing like the cool and composed Gianni when he made his lasagne. Of course, he drinks his way through cooking which is usually what I do. Past hour four of making the lasagne, I thought to have a glass of wine but I was afraid if I did, I would just lie down and not get up again. And then I thought to myself as I was rolling out all the pasta sheets (hour six), there’s a reason why people take short cuts. And I wish I was one of them at that moment. The lasagne comes out of the oven and you want to know was it all worth it. It was – almost. It was very, very good. But after all those hours, it should have been swoon worthy and it wasn’t. It didn’t make me swoon like the lasagne I had at Campagnolo. This is to be expected since it was my first attempt. After a few more efforts, I think this dish will get there. It has potential to be out of this world. 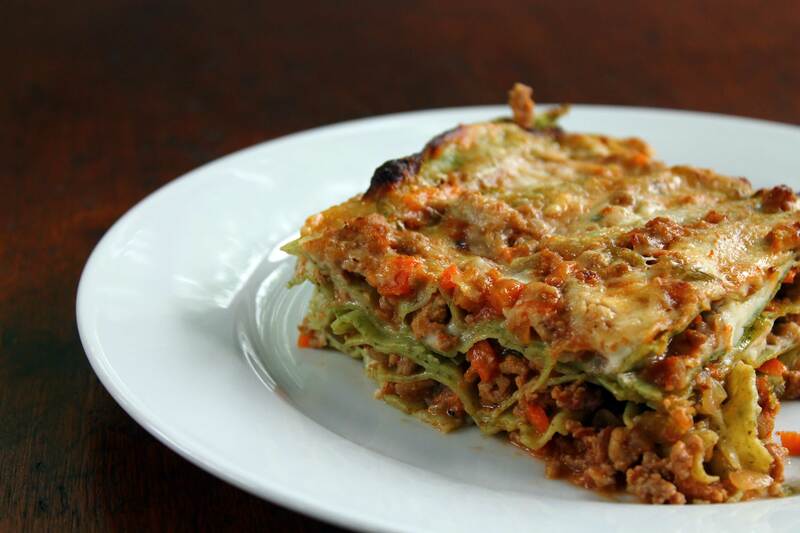 A made from scratch lasagne is a dish worthy of a celebration. It’s a labour of love. Make it to celebrate with your loved ones; everything always tastes better when shared with the people you love. The lasagne I made, Lasagne alla Bolognese al Forno, was from Mario Batali’s Molto Italiano. Usually at this point in my post, I list out the recipe. But there is a strict message in the cookbook that no part of the book is to be reprinted in any way without exclusive permission. So, I will refrain. But this book has been out since 2005 and a lot of libraries carry it or you can always borrow my copy if you’d like. On the food network website, they have a similar version to this recipe also from Mario Batali. You can find it here. The only difference is that in the web version of the ragu ingredients, the recipe calls for ½ cup milk and 16 oz canned whole tomatoes as opposed to the 1 cup whole milk and 6 oz can of tomato paste in the book. And here’s a tip if you’re going to use the web version: the instructions call for adding brodo (broth) to the ragu. It’s a misprint. No brodo required. Ooohhhh, lasagne. 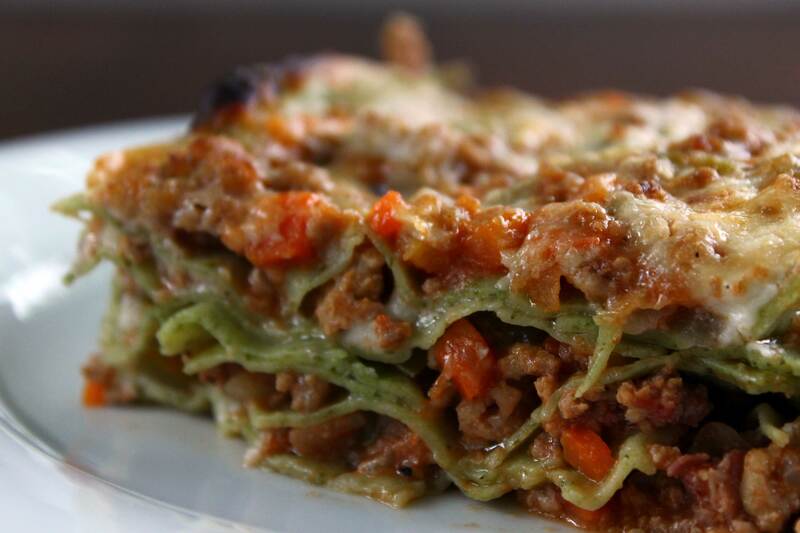 I’m going to make some in your honor – albeit a much easier recipe with lasagne noodles from Pike Place Market. My name is Ania Krysa and this is Food Anthology. Food Anthology is where I share stories about what inspires me to cook and what I love about food. With every story, I share a recipe. Food Anthology launched in January 2011. I live in Toronto, Ontario and am proud to hail from Cleveland, Ohio. Enter your email to subscribe to Food Anthology. You'll receive notifications of new posts by email. © Ania Krysa and Food Anthology, 2011. Unauthorized use and/or duplication of this material without express and written permission from this blog’s author and owner is strictly prohibited. Excerpts and links may be used, provided that full and clear credit is given to Ania Krysa and Food Anthology with appropriate and specific direction to the original content.